If you are not familiar with the Screen Machine, it is Scotland’s one and only mobile cinema which regularly brings mainstream movies to communities in the Highlands and Islands where there is little or no cinema provision. The cinema is in a specially built truck which, through the use of a very clever hydraulics system, expands to create a state-of-the-art 80 seat cinema. You can book tickets on-line here. We always keep back at least 9 tickets to sell on the day on the door – cash only for those, please. Those tickets will go on sale 30 mins before scheduled start times. “Screen Machine has a remit to support the development of new screening facilities and so we’re delighted to be able to play a part in Paisley 2021 Community Trust’s plans to create a new arts and cultural centre for Paisley’. 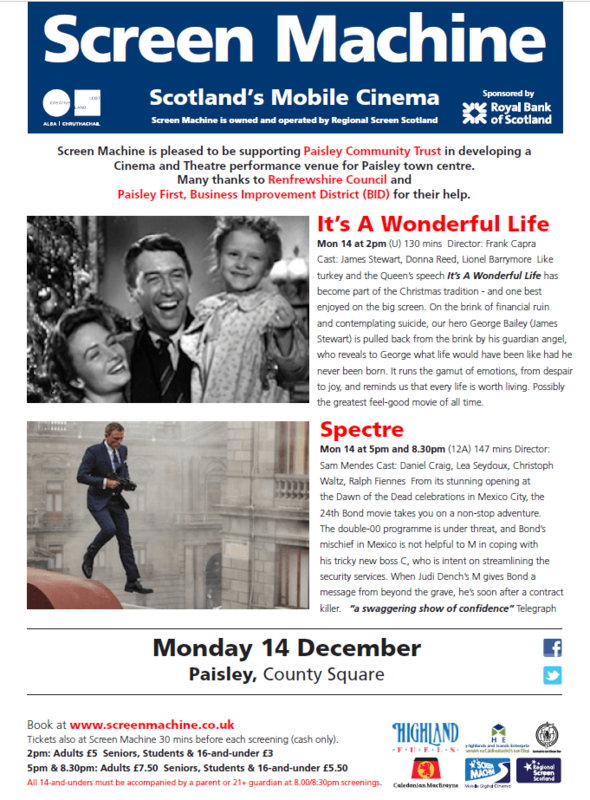 “We are delighted to welcome Screen Machine to Paisley for the first time. Our town has a proud and rich history in cinema, believe it or not, it’s been 18 years since there’s been a purpose built Cinema in Paisley town centre. The Community Trust are working to bring a permanent Cinema and performance Theatre back to town and we urge all Paisley buddies to support us. There is a 50p fee for each ticket booked on-line. There is no fee for on-th-door cash sales. For full information regarding our terms and conditions, please read here. If you are a wheelchair user, please contact us direct to make your booking.